Permaculture is a design system that utilises the natural features of the landscape. The term comes from the words 'permanent' and 'agriculture' and it is a method of developing an efficient and sustainable use of the land for shelter, food, energy and the community based on the systems found in the natural environment. It utilises knowledge of the environment and of how nature works with a strong ethical framework and uses these in the design process. Tools the permaculturalist uses in their work can include organic and forest gardening, green energy, recycling, composting, biodiversity... it is all about 'living lightly on the Earth and knowing her beauty'. As a fully-sustainable system it is all about preserving her beauty too. I hold a Certificate in Permaculture Design (PDC) and am working towards a Diploma in Applied Permaculture. I can advise on garden and landscape design along permaculture principles and also run short courses and workshops on aspects of permaculture and sustainability. "Permaculture is a philosophy of working with, rather than against nature; of protracted and thoughtful observation rather than protracted and thoughtless labor; and of looking at plants and animals in all their functions, rather than treating any area as a single product system." (Mollison, B. (1991). Introduction to permaculture. Tasmania, Australia: Tagari). In short, permaculture is a method of developing an efficient and sustainable use of the land for shelter, food, energy and the community based on the systems found in the natural environment. It utilises knowledge of the environment and of how nature works with a strong ethical framework and uses these in the design process. Tools the permaculturalist uses in their work can include organic and forest gardening, green energy, recycling, composting, biodiversity and ecological design. Like Paganism, it is a path that develops with you and your knowledge as you read around the subject to learn more. Permaculture’s ethical framework is usually expressed as Earthcare, Fairshare and Peoplecare. Earthcare gives provision for all life systems to continue and multiply. This is the first principle because without a healthy earth, no life – human, plant or animal – can flourish. Peoplecare means that all Earth’s Children should be able to access sufficient resources for their existence. Fairshare means that each of us should take no more than what we need to live and that any surpluses should be reinvested back into the system to recycle into useful commodities. “Love for and Kinship with Nature. Reverence for the life force and its ever-renewing cycles of life and death” which emphasises the importance of love and respect for nature and recognises that human beings are part of nature and that our lives are intimately interwoven with the web of life and death. "A positive morality, in which the individual is responsible for the discovery and development of their true nature in harmony with the outer world and community. This is often expressed as 'Do what you will, as long as it harms none' “ which recognises that everything we do, or refrain from doing, has consequences for ourselves and the environment. As we are part of the Web of Life, as Pagans we have a sacred duty towards it and to live in harmony with others and with Nature, to ‘live lightly on the Earth and know Her beauty' and to preserve Her beauty as well. These steps can be applied to a variety of projects from planning a smallholding with the aim of self-sufficiency to business planning but many Permaculture projects are land based. As the first step above suggests the first step in any permaculture design or project is to set objectives and to clarify what resources are available to carry out plans. After a plan is implemented then permaculture gives guidelines to continually evaluate the success (or otherwise!) of any design and to tweak it until the desired resulted are obtained. Each part of a design should have more than one purpose and should interact with other elements of a design so that what may be perceived as a problem is turned into a virtue. An often quoted example is the use of chickens in a permaculture design. On the positive side they provide eggs (and meat for non-vegetarians) but on the flip side they scratch at the soil, removing anything that is growing there and produce an awful lot of poop. 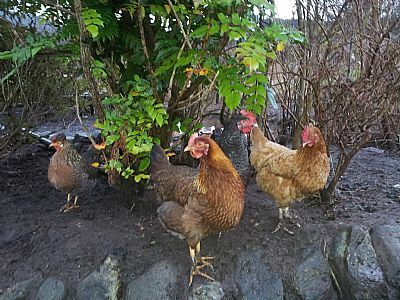 In a permaculture design using chickens these properties will be utilised: chickens can be built into a crop rotation system so that they clear the traces of a previous crop when land is laid fallow, clear slugs and other problematic pests, rake the soil into a fine tilth and manure the land. It works: I used them to clear the site before building my polytunnel and I didn’t have any slugs in there for three years. Now I have a few: but I’m now letting the Call and Runner Ducks in there overnight - they don’t damage the crops as badly as the chooks do - so they can hunt them out. So the ducks get overnight shelter and I get pests removed. Result! Since the original idea of zones the concept of Zone 0 – the home - has been added and even a Zone 00 for the person making the design and a Zone 000 reflecting their inner or spiritual self. My first involvement with Permaculture was through an introduction to permaculture course taken with James “NonStuff” Chapman at Beecraigs Country Park. Browsing on the Permaculture Association website for follow-on Permaculture Design Courses I came across a course run by Steve Read at the Patika Project in Faralya in southern Turkey. When I worked out it would be cheaper than any course I could take in Britain I was sold. The Patika Project was set up in 1996 by Erol and Cigdem Scott as a permaculture centre that also runs courses in yoga. They took a previously undeveloped site, lived there in a tent for six months while they built a stone house, and eventually adding log cabins and a communal kitchen and dining area which must boast one of the finest views in the world. There are chickens, a polytunnel, orchards of apples, oranges, lemons, pomegranates and mulberries, vegetables such as tomatoes, aubergines and peppers growing outside and grapevines everywhere. It truly is paradise. The course was, to my relief, conducted in English and students came from all over Europe. Daily yoga classes were also included and the whole experience was that of a spiritual and permaculture retreat which perfectly reflected my views that the practical and the divine should be closely linked. However living in Argyll (where rainfall invariably is above 100 inches a year) the information on drought management wasn’t so relevant! I grew up in the 1960’s and 70’s and like many used to watch the popular sitcom ‘The Good Life’. I’ve never followed a conventional career path and always wanted to have a go at being self-sufficient and to return to self-employment. An opportunity to leave my job with a redundancy payout and a (small) pension in my early 50’s wasn’t one to be overlooked and in November 2012 I took the plunge. I left, did a firewalk with the wonderful Oona Macfarlane of Tir na nOg the following day and by the end of the month was not only enrolled for a Diploma in Applied Permaculture but had attended the Diploma’s annual Convergence down in Birmingham. My objectives were clear: to provide a new source of income on a self-employed basis while living in as ‘green’ a manner as possible utilizing the ethics of permaculture in combination with Pagan spirituality. The physical elements of Earth, Air, Fire and Water are commonly considered as resources in a permaculture plan but for a truly balanced system I feel it is important that Spirit is included as well. After all, a Witch or Pagan has other resources not available to ‘Muggle Permaculturalists’ in that we can use reflection, magic and ritual and ask for the blessings from the Gods as part of our permaculture plan! Nearly three years on my ‘farmlet’ has been developed and component parts tweaked a number of times. We’ve installed a polytunnel, wormery, composting system, have enough eggs from chickens and ducks to fulfil all our own requirements and have a small surplus to sell on to neighbours and friends. We’ve built up an apiary consisting of four colonies of bees (five including the one we sold on to a friend), constructing a living willow fedge/windbreak around the beehives to keep people and deer away and to provide an early source of pollen for the bees as well as a source of willow for craft projects. On the renewable energy front we have a wood processing area close to a woodshed which doubles as a fence at the top of the garden and with a ‘green roof’ consisting of a growing area for salad greens and strawberries. Our heating and hot water comes from sustainable sources. We use the nearby beach and sea loch as a source of seaweed for the garden and grit for the chickens – and they love rummaging through it in search of insects so it gives them some entertainment as well. I studied on the New Farmer Scheme with Nourish Scotland last year and have also gained an NVQ Level 3 Diploma in Funeral Celebrancy so I now work as a Civil Funeral Celebrant as well as conducting legal Pagan wedding ceremonies on behalf of SPF. I’ve yet to complete my Permaculture Diploma but when I do I’ll be starting to run permaculture, small-holding and craft skills workshops as part of my ‘obtaining a yield’ objective. Last but certainly not least we have been known to make the odd barrel of beer and bottle of wine! We’ve achieved all this in a garden measuring 10m x 25m and with the use of part of a local field for the apiary and a scavenging/firewood licence from the Forestry Commission. It would not have been possible without a comprehensive Permaculture planning system, a lot of hard work – and the blessings of the Gods.